"Countess" is a newly arrived Aicon luxury motor yacht distinguished by her elegant profile, high performance hull and luxurious comfort. 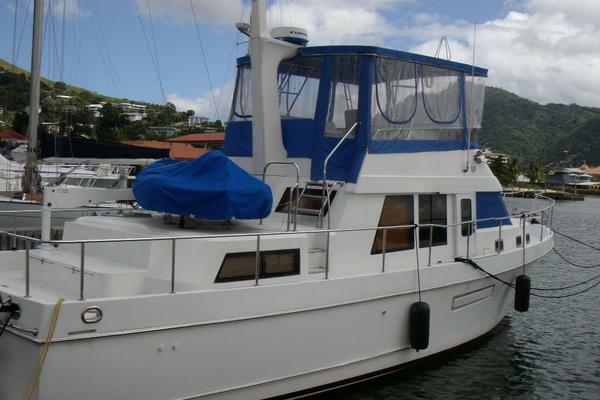 She has been professionally maintained by her captain and is seriously for sale by her original owner. What makes her standout from the others is her factory hardtop, 1,000 HP Caterpillar upgraded engines, custom galley/dining design and her professional maintenance. Designed with a high gloss cherry wood interior through out, she comfortably sleeps 6 in three staterooms plus crew quarters. The large aft deck leads through double sliding doors to the same level salon with L shaped lounge and seating for 8. Moving forward and up is the larger custom dining table to starboard and a long bar separating the custom galley to port. The well equipped lower helm is forward with a spiral stair to port leading to the staterooms. The Master Stateroom is amidships with queen size bed and in suite head with separate shower. The VIP Stateroom is forward with double bed, head and shower. The Guest Stateroom has 2 single berths with day head opposite. The crew quarters, including head, are aft. "Countess" is being offered for sale with slip and storage discounts for new customers to Brewer Marinas in Rhode Island. We are the exclusive broker for "Countess". Keep in mind that R.I. does not have a sales or use tax for vessels berthed in state. Transport to Europe and the Islands can be also be arranged from 2 nearby international shipping depots. Please see full specifications and photo gallery for complete details. United Yacht Sales New Jersey would love to guide you through a personal showing of this 56' Aicon 56 2006. This yacht for sale is located in Warwick, Rhode Island and priced at $525,000. For a showing please contact us by filling out the form on this page and we will get back to you shortly!